The year is 2023, and much of the world enjoys great wealth generated by the triumph of information technology. However, the staphylococcus plague of 2006 wiped out 40 million people, and the 2020 assassination of American President Emily Forrester traumatized the nation. Through it all, the internet remains the main source of information, bombarding people with news, rumors and allegations twenty-four hours a day -- while creating enormous possibilities for the manipulation of mankind. Into this world of deception wanders Dr. Gideon Wolfe, a New York psychiatrist, criminal profiler, and historian. Wolfe comes into possession of a computer disc that contains startling evidence that the now-famous visual record of President Forrester's assassination was digitally altered. Stunned and enraged, Wolfe sets out to unravel the full tale of the Forrester hoax. His journey leads him to a secret group of scientific and military experts who seek to expose the astonishing degree to which the public can be deceived and manipulated in the Information Age. Wolfe joins the team and discovers that their efforts instigate the most horrendous single act of mass murder in world history. Relentlessly suspenseful, Killing Time reveals a new side of a master novelist. Honestly I couldn't get past the 2nd disk because Caleb Carr's narration drove me insane. I love him as an author and historian but as a narrator -- never again. It made me realize how vitally important to an audio book the talent is that reads the work. It's not just a reading, it's a performance. And in the hands of an unstudied actor -- even if it is the person who wrote the words -- the characterizations become caricatures. I love Caleb Carr novels! I put off reading this one because I'm not a sci-fi afficianado, but I was not dissapointed. Sure it was a little hard to envision plot wise but I still found it hard to put away. His characters are always well defined and I feel like I'm actually understanding and getting to know them. I'm looking forward to receiving The Italian Secretary. I also listened to the Lessons of Terror. His novels always make me think outside the box. Keep an open mind on this one. This book is ponderous and pedantic. Please don't bother with it. The idea behind the plot is interesting (information is not knowledge is the only good phrase in the book) but so frequently are you thrust out of the story by the poor writing and terrible dialog between the characters that by the time the book ends, with its plot never fully fleshed out, you will be relieved. I wasn't paying attention so had no clue this was sci-fi/futuristic when I started listening. I caught on pretty quickly though and was compelled. At every step along the way, I wanted to hear what was going to happen next. Unlike many books currently in the marketplace, I was not able to predict the next events. In addition to a fun, fast-paced story, this book offers a pithy commentary on our technology-obsessed world. On the downside, it was pretty violent which I don't care for, and the main female character was a Lara Croft-like male fantasy figure... Not a bad way to spend a commute! Narrator has a lisp and listening to him was difficult at best, I could of tolerated if the book had been interesting. I think the title sums up my opinion of the book. The premise was interesting, but constant repeition of it throughout the novel got to be tiresome. The writing could have been better. Often times the characters seemed poorly developed. The dialogue frequently sounded stilted and less than natural. 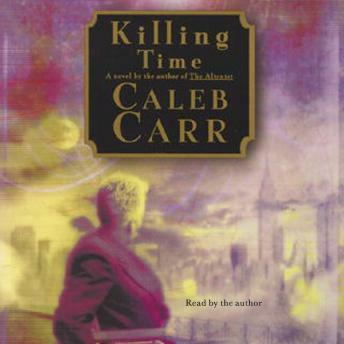 I have read the other books by Caleb Carr, so was very interested in 'Killing Time.' The book did not let me down. The book was very well written and kept my attention. It is a great story that makes you think about news stories in our time.